In a recent Citizens Inquiry in the Wirral, twenty residents from all walks of life worked together over nine evenings to think through how to make alcohol a healthy part of their community and reduce the harmful aspects, in terms of personal health, social conflict, or economic costs to our health services. Their varied personal experience and stories were supplemented by short inputs from a range of professional commentators, who they cross-examined to explore the complexity of tackling alcohol harm. One of the youngest participants expressed their pleasure in being listened to properly by local adults and professionals, and they are now determined to keep meeting together with other residents to seek change in their communities and services. The local manager from Public Health was equally amazed by the ability of the residents to produce a consensus on very challenging issues. By the end of the process, the residents created their own recommendations for community action and changes in service delivery, and met with professional stakeholders to develop joint action plans. See the result of their hard work in the Wirral Alcohol Inquiry Report. A well run citizen inquiry shows that diverse communities and willing professionals can combine when the residents take the lead on their own issues and concerns, and the professionals listen to them and see the community as the experts on their own lives. It made me think about the ‘us-and-them’ culture which has bedevilled exchanges between ‘the system’ and ‘the people’. Cormac Russell’s inspiring and eloquent assertion of Asset Based Community Development (ABCD) in a recent TEDx talk has provided a very necessary corrective to the ‘professional knows best’ culture, in a world where leadership is still predicated on a powerful boss (the Alex Ferguson model of leadership) and where democracy is still ‘under duress’ with unrestrained power to elites. See Cormac’s TEDx talk below. ABCD focuses on the strengths of previously-maligned communities, emphasising local people’s talents and desire to take action on their own behalves, building a community which they own. There’s a long tradition of citizen-led change, where people’s own gifts are shared to change their worlds and liberate themselves – from William Blake’s “mind-forged manacles” of 1794 to Bob Marley’s “emancipate yourselves from mental slavery”, the passion of citizens has created a world undreamt of by planners and decision-makers. The Five Ways to Wellbeing developed by the New Economics Foundation underline that it is self-action that counts. ABCD helps this process by inspiring people to believe in themselves, sharing their stories about successes achieved by communities taking the lead over their own lives. Cormac’s enthusiastic assertion about community-led change has borne fruit in many ABCD initiatives worldwide, and have been particularly valuable in proclaiming self-belief in working class communities (in a culture which has demonised people as chavs (‘Shameless’) and the ‘enemy within’- a deep legacy of the miners strike). This demoralisation of citizens has started to be challenged again by active communities: the Hillsborough campaign shows how self-organised communities can hold the powerful to account. I’d stress another important element – professionals’ skills and resources are needed still if they can be harnessed by communities without being dominated by professional goals. Shared Future’s Citizens Inquiries have revealed how communities can teach the professionals to become enablers, and reinforce those in public service who are already trying to be facilitators and challenge their own hierarchies to change their approach, seeking to turn the world upside down so that the grassroots leads the way : “you said, we did” becomes replaced by “you say, you do, we help when you approach us”. So while sharing inspiring stories from residents about self-help, we also need to gather citizens’ stories about how the systems’ resources and behaviours have been guided by residents experiences and ideas, to meet community interests. It’s about creating an enabling state and enabled citizens, pooling resources to support citizen-led social change. ABCD has had to emphasise starting from the positives – not demoralising & stigmatising communities by starting as if they are problems-to-be-managed-from-above. This emphasis is again a necessary corrective. 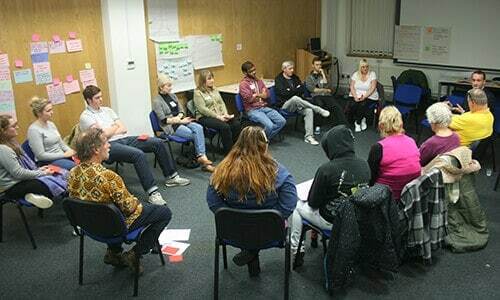 But rejecting the problems-orientated approach does not mean that there aren’t actually problems which need addressing – it means that ABCD ‘s inspiration of community collective action means we can address problems too, acting together by building from positive strength and morale. Past negativity has made it very hard to see any light at the end of the tunnel and acted as a barrier to generating energy for grassroots action – ABCD and other positive approaches will help revive hope and belief in communities worth building together. There is no magic bullet or single path. ABCD and other empowering approaches, such as citizen inquiries, are helping to reinforce a new culture of enabling – and where necessary defending important services and defining how they are delivered to meet community need. Residents are at the heart, and professionals need to see themselves as a community of public servants, not public masters. Blog written by Nick Beddow, May 2016.
by Cormac Russell at TEDxExeter 2016.